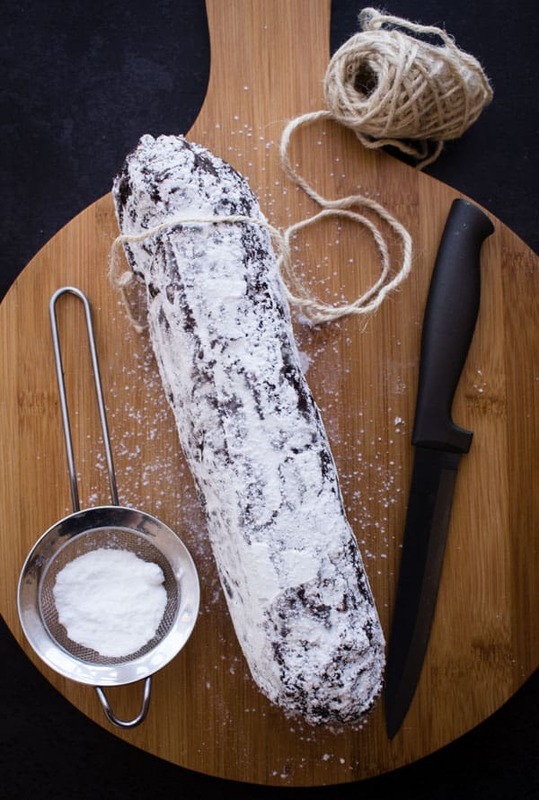 Chocolate Salame a delicious Italian Chocolate recipe, a fast and easy no bake sweet. Snack or Dessert the perfect treat. 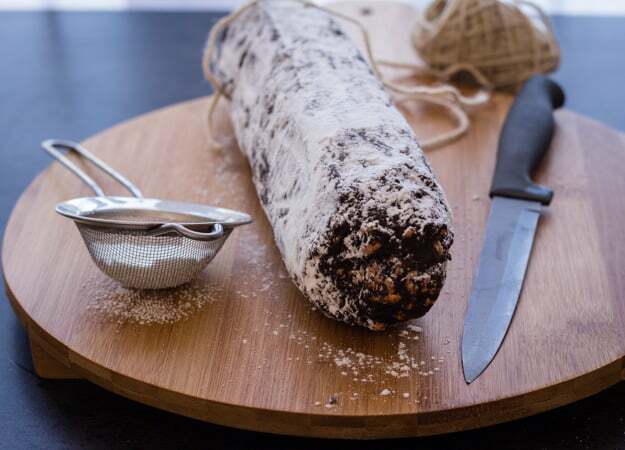 My daughter has been bugging me for so long to make Chocolate Salame. So when she got back from a visit with her friend’s family, she started again on “Ma you got to make this, I even have the recipe”! My husband I have to say had never tasted it before and said he had never heard of it before either! 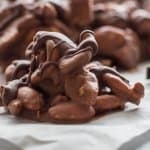 Which needless to say was a complete surprise to me, as this tasty No Bake Chocolate recipe is a must make for most Italians at either Christmas or Easter. So after making it a couple of times and mixing up the recipe, I came up with this winning combination. And it was so good. Creamy and chocolatey. Made with dark chocolate, cocoa, icing sugar and tea biscuits, I did add eggs because I believe it tastes better with them. 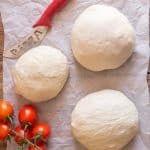 All lot of Italian recipes are with raw eggs, from Chocolate Salame to Tiramisu, although of course we tend to use pasteurized eggs more. After I made the Salame. I rolled it up and refrigereated it for approximately 2 – 3 hours. 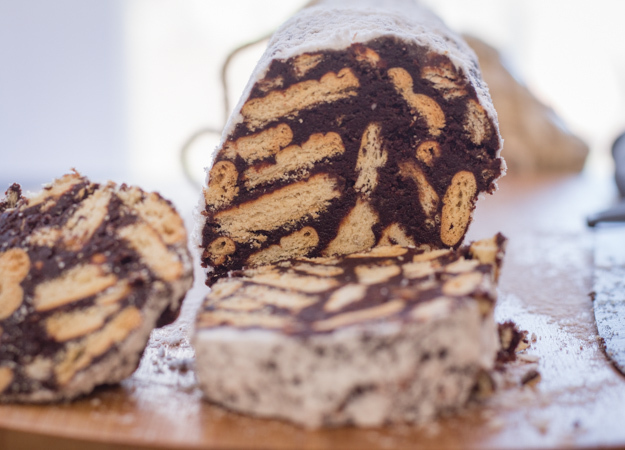 I removed it from the fridge, rolled it in some icing sugar and then presented it to the Italian. 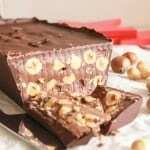 I asked him if he would like to cut the Chocolate Salame? After the first slice he exclaimed “It looks just like Salame and tastes amazing”! 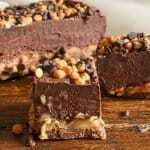 Easy and no bake just what I like. Enjoy! 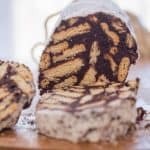 Chocolate Salame, a fast, easy, no bake, Italian sweet dessert or snack. The perfect Easter or any time treat. 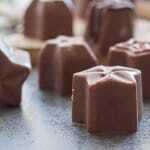 In a medium bowl, beat until creamy butter, add sugar and milk and combine, add melted chocolate and cocoa and combine, then add eggs beat together, fold in broken cookies. 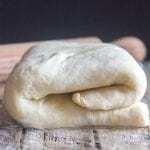 On a large piece of parchment paper place mixture and roll into a log shape, wrap with paper and refrigerate approximately 2-3 hours or overnight. 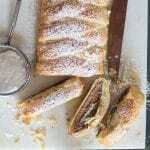 Before serving, roll in icing/powdered sugar. Slice and serve. Enjoy! ** For the replacement of raw eggs, you can try using a product called Egg Replacer or there are now pasteurized egg products and pasteurized eggs available. ***You could also replace the eggs with extra milk 2-3 tablespoons more. 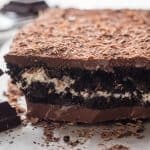 Other No Bake Chocolate Desserts you may enjoy! 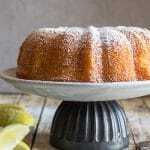 Hi Rosemary I made this for Christmas and again how easy to make and great tasting. My grandson actually thought it was a Salame. What a great idea. Hi Mil, thanks so much, so glad you and your grandson liked it. Could this be made ahead of time? How long would it keep in the fridge or could it be frozen? 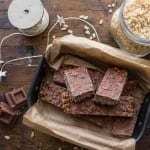 My kids and I love all things chocolate. This is just simply wonderful! Hi Christine, haha me too. Enjoy. Wow! 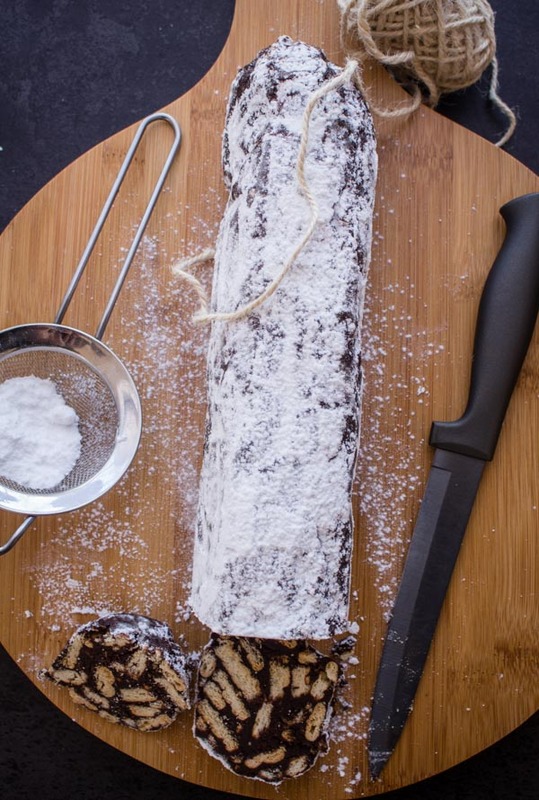 This is so creative and I’d never heard of chocolate salami before. It also looks easy which for me is a real plus! Thanks so much Carol, and yes really easy. Hope you enjoy it. We are hosting Easter at our house and it’ll be great to see our kids and grandkids. It’s been a long three months. 🙁 I bet our grandsons would get a big kick out of the chocolate salami — they are crazy about regular salami. I’ll let you know what they think. I don’t think I’ll tell them it’s chocolate. Un Abbraccio! Hi Marisa, thanks I hope they enjoy it!